Nice bikes. Especially the TSX. I have a question about that one. The bottom bracket on that is unique and not many Bianchis I have seen have it (gussets on the chainstays and the little B's on the lugs). I have one like it but it says SLX but I don't think that is what it is. My question is can you feel any ribbing in the downtube and seattube at the bottom bracket junction (with the BB removed and if you put your fingers up the tubes). I can't feel any any so I think mine is a 1993 El but I am always looking for confirmation. 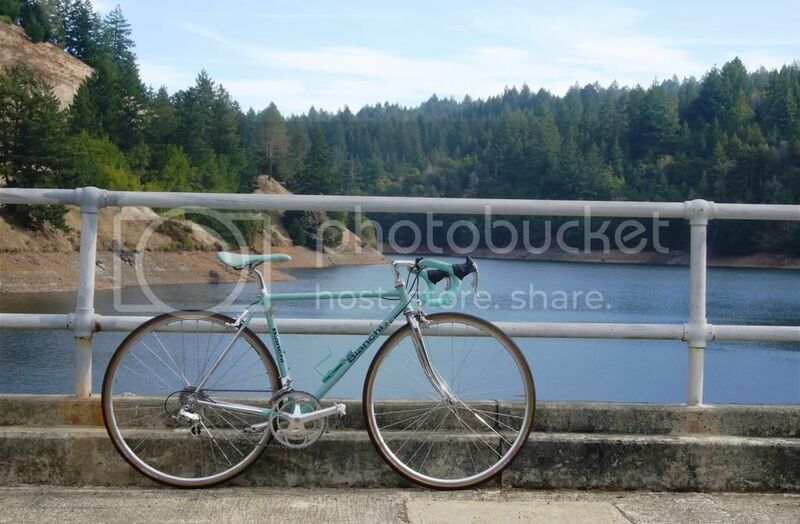 Here is a picture of mine at one of my favorite spots, Alpine Damn in Marin County California. Mostly built with 1994 Record. Bike is a blast; rides and handles well and climbs like crazy (really surprises me given its weight). I like the heavier Record components and wheels (compared with my other bikes). I tried 200x Record crank on it and it was just not the same.